Completed at the end of 2017 and officially opened to the public earlier this year, the Rainbow Bridge has quickly become one of SPF:a’s most recognized and honored projects. 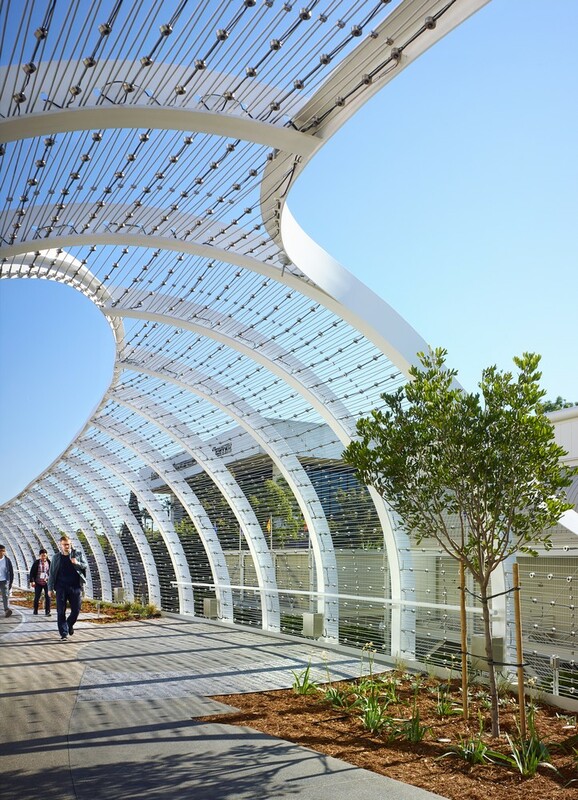 Capped off earlier this month with a win at the Southern California Development Forum Design Awards and an honorable mention in The Architect’s Newspaper 2018 Best of Design, the Rainbow Bridge has received 10 regional, national, and international awards for its architecture, engineering and landscaping design, including an Architizer A+ Popular Choice Award and the Engineering News-Record SoCal Project of the Year. 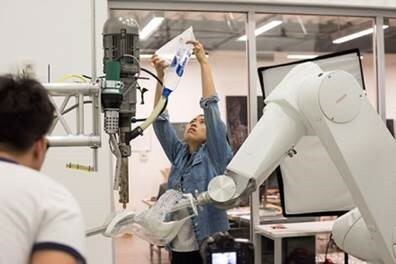 As 2018 winds down and the Rainbow Bridge turns one, we wanted to recognize a year of success with a look back at the inspiration, collaboration, and dedication that made this project possible. In that spirit, we hope you enjoy this detailed case study, found below. The structural design of the bridge is based on a standard Caltrans bridge template with concrete supports and a box beam spanning between columns. We dissected the main components of this boilerplate scheme and then reinterpreted our findings in a more playful and innovative way. This more sophisticated rendition addresses the site’s unique geometry and answers the city’s call to integrate more landscaping by programming a park into the path of the bridge. Similarly, we used the guardrail as an opportunity to add vibrancy to the bridge; the hull-like formation has been married with the grace and uniformity found in waves, while the LEDs were affixed to cables to convey a net-like feeling of the rigging of a ship. The bridge maintains a very streamlined profile even as all of these different details come into play. 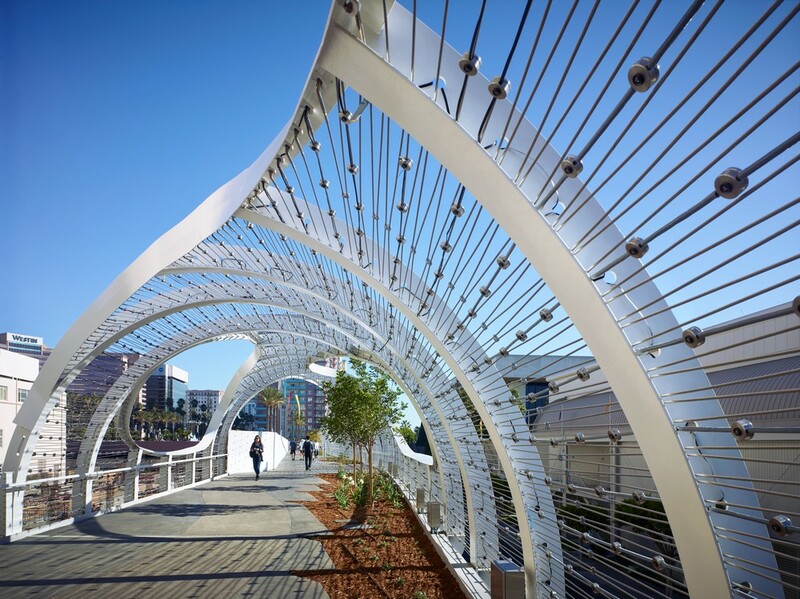 The bridge’s two defining features are most certainly its wave-inspired steel framing and its dynamic lighting fixture. The fixture is a unique specification selected by our design team, custom developed alongside Carl Stahl Architektur. As we began construction, our contractor wanted to replace the lighting system with a different manufacturer they had worked with previously. 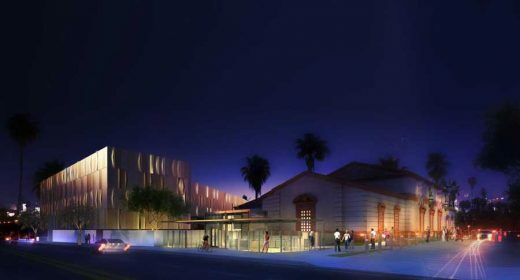 We, however, were more than confident in the superiority of the Carl Stahl piece—we just needed to make a case for its appropriateness.To do this, we set up a performance test on site and involved all of the project stakeholders—this included the owner (representatives from the City of Long Beach), the lighting designer, and the contractor. All parties had a chance to evaluate the fixture we chose against the contractor’s, and following the demonstrations, it was unanimously decided that our fixture was the better option.The bridge canopy that we have in place integrates 3,500 color-changing LED node lights, 100 downlights, and 70 floodlights. The lights can be programmed and synced to complement everything from music to performances, or be left static as a bioluminescent lightscape, in either use providing the bridge with another dimension.The lights themselves are quite unique in that we worked with Carl Stahl and the steel cable provider to develop two custom node clips that could either fasten the lighting system or tension the stainless steel canopy. Although the pieces serve two different functions, they are aesthetically analogous and appear as one succinct system. The design also allows for ease of installation and replacement flexibility. This project is unique in that we used the most up-to-date software to 3D model and document the bridge, but we were required to translate this complex design into 2D drawings that a public works contractor could use to build the bridge within budget, and with the limited technology available to them.Worth noting is that city contractors are production oriented and not accustomed to building with high-end tolerances or sophisticated machinery. In fact, no one on our assigned team had ever constructed a bridge like this. In order to realize the intricate, architectural wave, we worked in very close coordination with the steel detailers, regularly visiting the fabrication yard and advising workers on what they could do to maximize their capabilities and push beyond their perceived limits.The fruits of this collaboration are best exhibited in the oculus of the bridge canopy. This design detail is expressed using a 20-foot-high continuously bending steel plate that attaches to arcs of varying heights. 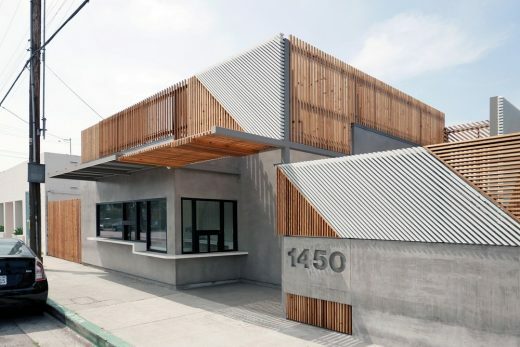 This twisting steel ribbon was built almost completely by hand, essentially starting from a steel plate draped like a cloth to meet the curves of the frame, and then trimmed to a uniform appearance. 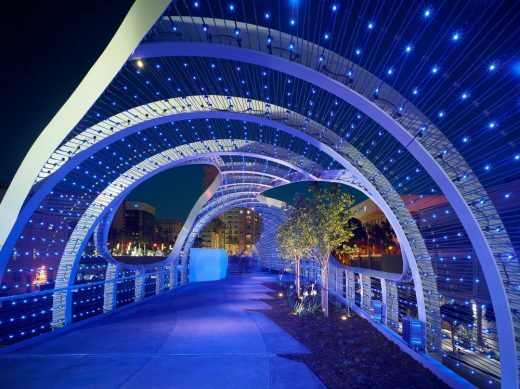 Our working title for this project was Riptide but the City of Long Beach opted to christen it the Rainbow Bridge, which we’ve come to understand references the nearby Rainbow Lagoon. While we would have much preferred our moniker be made official, we understand that a rainbow is far less threatening than a riptide. And ultimately, making this bridge a reality was about both innovation and getting individuals out of their comfort zone. 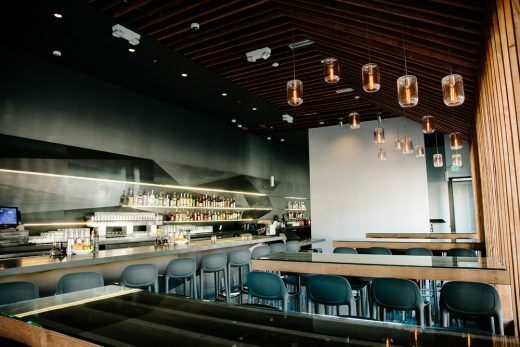 We are grateful to have worked with such a talented, open-minded, and motivated team.Although budget constraints largely shaped the design approach and construction, it did not affect the quality of what we were able to create. We managed to build something that is not just very architectural, but artistic and dynamic in function. 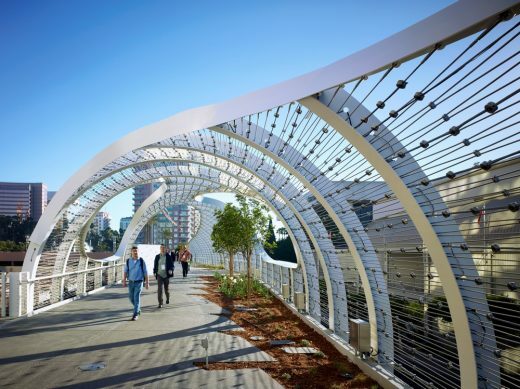 Today, visitors and locals can use the bridge not just to get from point A to B, but utilize the span for respite, community, and revelry.The bridge is more than just a way to get from point A to B, but a space for individuals to find respite, community, and revelry. 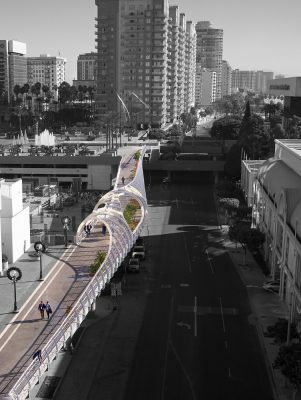 The 605-foot-long design draws inspiration from Long Beach’s history as a dynamic seaside town with its active port and local attractions. 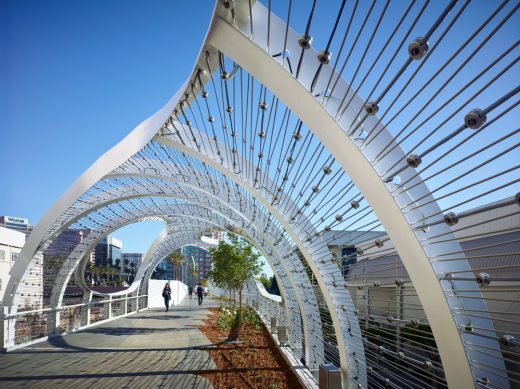 The form is conceived as an abstraction of a breaking wave with a deck that is composed of multifarious elements that typify a boardwalk environment, such as the paving, seating, and landscaping.Construction was a concerted effort and we worked closely with Arup to engineer the bridge. 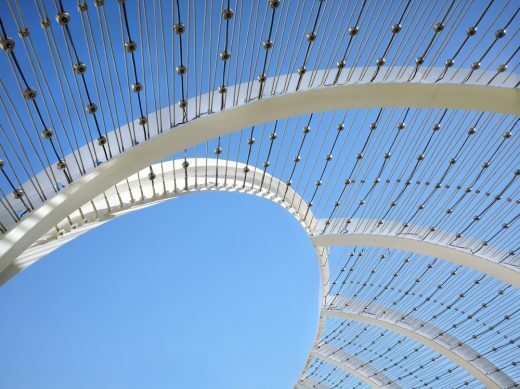 Originally, the bridge called for 80 or more uniquely formed rib beams, but to bring the cost down we had to modify the steel geometry and concrete profile in a way that just one shape could achieve a similar dynamic form when placed in repetition. 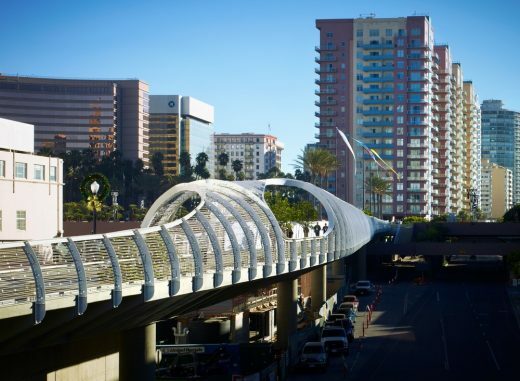 As it is today, the project is formed by a top frame of 76 custom-welded bent-steel ribs, and a base of approximately 1,200 cubic yards of poured-in-place concrete. 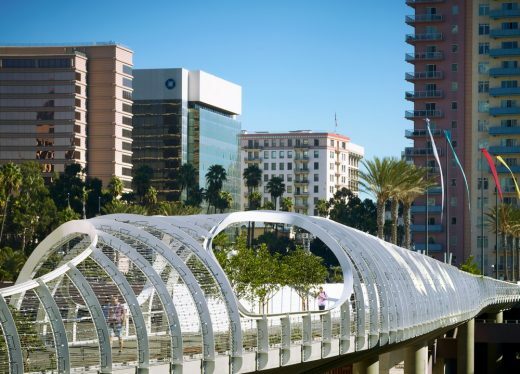 The Rainbow Bridge—more formally known as the Long Beach Seaside Way Pedestrian Bridge—can most succinctly be described as a custom bridge built on a Caltrans budget. 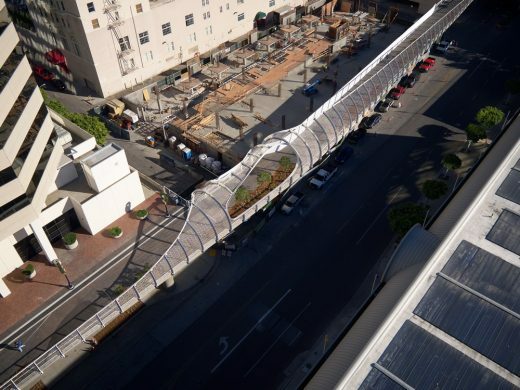 When the City of Long Beach first set out to build this link, they had a very rudimentary, elevated sidewalk in mind. 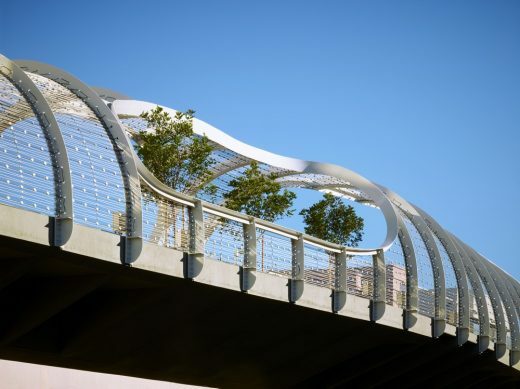 The goal of the new bridge was simple: offer a public connection between two banner venues, the convention center and the performing arts center. As it was, moving between the two destinations required climbing several flights of stairs and traversing a stretch of road dominated by loading docks and HVAC equipment—hardly the highlight of an elegant affair. Despite the limited amount of money allocated to this project, we knew the bridge needed to be an experience, not just a concrete traverse. We decided to get creative with a Caltrans template to create an open, urban amenity that would not just remedy the circulation between the two centers but provide the city with a new public meeting place and a distinct architectural marker. SPF:architects (SPF:a) is pleased to announce that the Long Beach Seaside Way Pedestrian Bridge (less formally known as the Rainbow Bridge) was named the Southern California Project of the Year at the annual Engineering News-Record California Best Project Awards, held last Thursday morning at the Omni Hotel in downtown Los Angeles. Sharing the award with SPF:a was international engineering firm Arup, the project team’s structural and civil engineer. 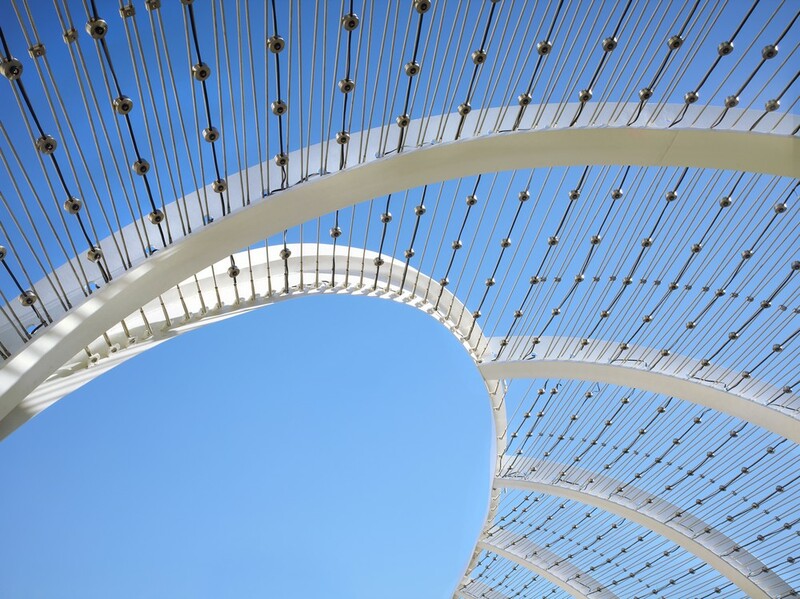 The bridge is perhaps most notable for its wave-inspired steel frame, made up of 76 custom-welded bent-steel ribs and approximately 1,200 cu yards of poured-in-place concrete at its base. 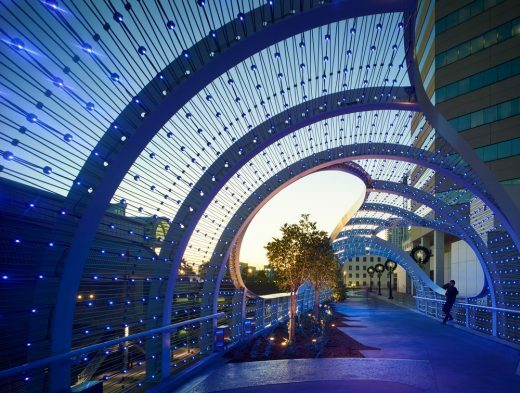 The bridge canopy features 3,500 color-changing LED node lights, 100 downlights, and 70 floodlights, all of which can be programmed and synched to music to create different effects. Three panels of judges reviewed more than 100 projects to determine the initial list of winners before choosing by consensus one project from Northern California and Southern California to stand as Projects of the Year—entries that “clearly outdistanced other winners.” ENR holds regional awards throughout the country, as well as a Best of the Best Ceremony that will take place this April in Manhattan. All Regional Best Project of the Year winners are nominated for the award, with an announcement of the national winners expected early in 2019. The Rainbow Bridge also received an award for Best Landscape/ Urban Development Project at Thursday’s ceremony. Hood Design Group was the project’s landscape architect. 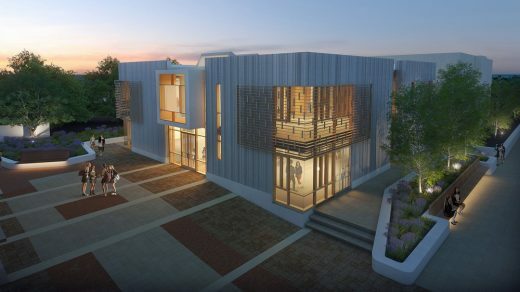 The general contractor was Powell Constructors, with electrical work by Elecnor-Belco Electric. Carl Stahl Architekur provided SPF:a with additional input in designing the bridge’s custom lighting fixture. The Rainbow Bridge has now received 8 regional, national, and international awards for its architecture, engineering and landscaping design, including a California Council of Engineering Honor Award and the Architizer A+ Popular Choice Award for Transportation Infrastructure.